Looking back it looks clear that the housing market on Vancouver’s Westside saw peak activity in mid to late February. Since that time sales and prices have been falling off. It really is neighborhood specific and also varies depending on the type of properties being sold. Land Value and older homes still seem to be attracting the most number of buyers. Prices of building lots still appear to be close to peak levels in certain School Catchment districts. Homes in the range of 10 to 25 years appear to be experiencing the highest level of falling demand and softening prices. We are seeing far fewer immigrant buyers this year and those that are looking are faced with much stricter lending guidelines by the banks. Money is just not as free flowing as it was last year! 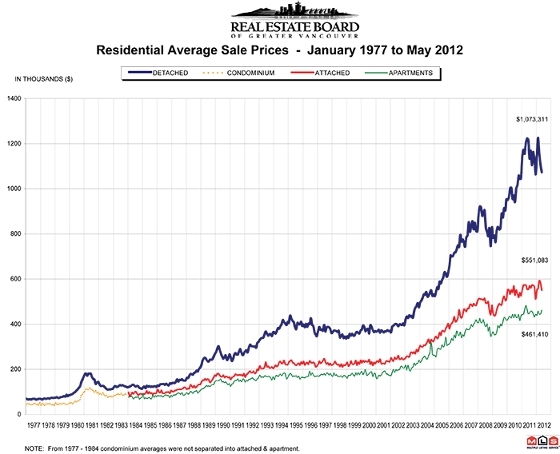 - Average selling price of a house declined by 8% in May this year versus May 2011 and prices are up 3% year to date. -There were 8.75 months of housing supply at the end of May this year versus 2.62 months supply last year. - During the month of May Townhome sales fell 30% and Condo sales fell 8% compared to May 2011. Year to date Townhome sales are down 32% and Condo sales are down 19%. -The average selling price of both Townhomes and Condos was unchanged in May this year versus May 2011. Year to date the average sale prices are 1% higher for Townhomes and 1% lower for condos. - There were 31% more Townhomes and 28% more Condos listed for sale at May 31st this year versus last year. - At May 31st this year there were 7.3 month`s supply of Townhomes versus 3.9 months a year ago. For Condos there were 5.6 month`s supply this year versus 4 months a year ago. While all segments of the market appear cooler, the Single Family market looks to be feeling the slow down the most. This all being said,`` it`s not all doom and gloom out there``. Keep in mind we are comparing 2012 figures with a very busy record year last year. The market now looks to be acting like a normal market with supply & demand fairly balanced in the Attached market and the Single Family market in a `Buyers`market with some price softening. This adjustment is healthy as prices come more into line with the fundamentals. Buyers are also able to take their time house hunting with no immediate pressure to make an offer like in past years. For a more comprehensive market analysis specific to your neighborhood please call me anytime to schedule an appointment.